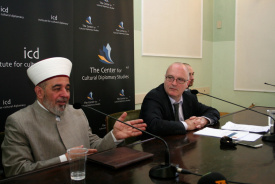 Sheikh Akhmed Tamim is an internationally renowned scholar of the Islamic world and the Head of Administration of Ukrainian Muslims. He arrived in Ukraine in 1976, where he graduated from the Department of Computer Science at the Kiev Polytechnic Institute. He soon earned his Master’s degree in 1982 with his dissertation on ´Microprocessor Systems and Local Area Network, ´ where he used his skills and knowledge soon afterword’s working in foreign companies. He received his Islamic theological education in Syria and Lebanon at The Arab University of Beirut where he gained his doctorate in theology. In 1994 he was elected to the First Congress of Muslims of Ukraine Mufti of Ukraine. That same year, he very quickly used his position to construct the Ar-Rakhma Mosque to accommodate the currently 2 million Muslims in Ukraine, of whom 60,000 live in Kyiv. 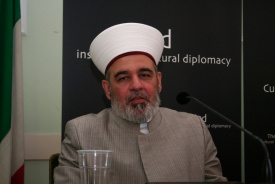 Mufti Akhmed Tamim is the author of several books on Islamic religious studies.